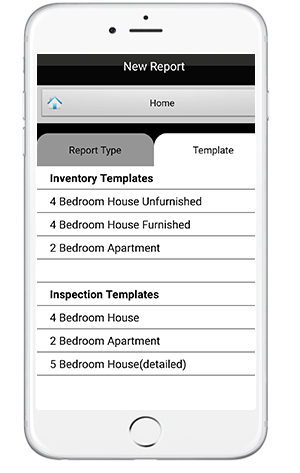 Our mobile inventory software has a range of easy to use features built in, for completing detailed property inspection reports. Getting started manual and online training videos. 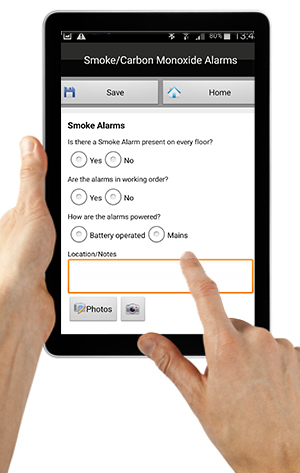 Reports instantly available online as a PDF direct from your android, iPhone or iPad device. Customisable item lists bespoke to your portfolio template requirements. Date/time stamped photos following TDS/DPS guidelines. Import photos straight from the photo gallery on your device. Copy the data from one room to another. 30 days to edit reports online at no further cost. Customise reports with your logos & disclaimers. Software upgrades and technical support at no additional cost. Sign each report electronically with our digital signature feature. No contract, No monthly subscription charges. Pay as you use monthly tariff. Clients using our property inventory app are producing reports in less than 50% of the time it previously took using conventional data gathering methods, eliminating back at the office admin, saving your business valuable Time, Money and Resources. Will significantly reduce the time it takes to complete property inspections, streamlining work flows, will drive significant improvements in productivity whilst improving staff satisfaction levels through the removal of repetitive data entry. Using TIM will ensure yours report are professional looking, consistently laid out in the same format, branded with your logo, company colours, T&C’s and disclaimers. Completed reports can be exported from the device into your online account within minutes and emailed directly to the tenant/landlord. TIM is guaranteed to reduce office admin costs and simplify the reporting process, by eliminating costly paper trails. Download and convert previously completed reports back onto your device, and add new notes/comments/photos and meter readings. Once my report is produced, how can I access it? Yes via the online portal, we offer 30 days to make any changes without further charge. Mobile reporting is on the increase as advancements in tablet and smart phone technology has provided the tools to carry out property inspections smartly and efficiently. Forrester’s global business and consumer tablet forecast 2013 / 2017 Worldwide sales of tablets in 2013 will exceed 381 million units, by 2017 the global sale of tablets will reach 905 million units, almost 1 in 5 (18%) will be a business purchase. 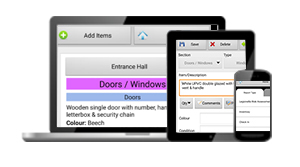 Don’t get left behind The Inventory Manager’s software operates on Android tablets or smart phones, iPads & iPhones. Please note the sample reports are only to show the layout/format. Your reports can be customised with logos, company branding colours, T&C’s and Disclaimers. New items, conditions and comments can be added into the custom drop down lists for future use. Photos taken using your device embed into the report and are date/time stamped. What are the report costs? Prices are on a pay per report monthly invoice basis, with NO CONTRACT. No subscription, or yearly fees, just a simple pay as you go tariff based on the reports you submit. POA for companies who operate multiple offices, please contact our sales team at info@Houser.co.uk to discuss your requirements. How do I set up a full account? If you would like to open an account, there is a £120.00 initial payment which includes VAT, please note this payment is to credit your account moving forward, and is deducted from your pay as you use monthly invoice/s. We require NO payment until your initial £120.00 has been used, after that it’s a simple ‘pay as you use’ monthly invoice.